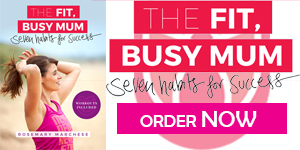 Rose is the author of the recently published ‘The Fit Busy Mum: Seven habits for success’ and is Founder of www.thefitbusymum.com.au – a website for busy mums who are looking for ways to be inspired to lead a fit life while achieving amazing life goals. Rose, with her physiotherapy degree, has worked in the fitness industry for over 20 years and has experience as a personal trainer, group fitness instructor and course developer. She is a highly sought after course writer and consultant and is currently the Subject Matter Expert for the Australian Institute of Fitness. She is the author of Australia’s leading textbook for the fitness industry, which is now in 3rd edition – The Essential Guide to Fitness. Her other textbook ‘The Specialised Exercise Trainer’ won an educational award in 2013. Rose was recently on the team that revamped the Pregnancy and Exercise Position Statement for Sports Medicine Australia and was the selected consultant to lead the update to the Australian fitness standards that were in endorsed in 2015. “Rosemary Marchese is a leading fitness expert who walks her talk and sets a great example for women balancing work, kids and their own health. This book is a must have.” Guy Leech Former Australian Ironman surf lifesaving champion. He won seven Uncle Toby’s Super Series races and twice won The Coolangatta Gold.